Create YouTube photo slideshow to showcase your photos in a slideshow format on YouTube . While many people consider YouTube to be synonymous with videos and movies, YouTube offers a great feature to users who want to upload their photos in a cool slideshow format. YouTube is one of the mot popular video websites and as a YouTube users, users can upload their photos of friends and families to YouTube in a slideshow format. If you want to create YouTube photo slideshow and upload slideshows to YouTube to share oath friends and family, YouTube offs a great feature to create YouTube photo slideshow by uploading your photos from your Picasa or computer to YouTube . If you want to create YouTube photo sideshow follow the simple steps below. 3. Click on Create under the Photo Slideshow feature. Choose the Picasa album you want to create YouTube photo slideshow for or upload photos from your directory. After uploading photos, click Next and preview the slideshow YouTube has created. You can also attach a audio clip to it. Once you are satisfied with the Photo slideshow, upload it to your YouTube channel like this you can create YouTube photo slideshow for all your albums and share it with friends and family. Google owns YouTube and has a list of Google YouTube Channels that you should subscribe to know the latest product releases and features. YouTube is owned by Google and provides a dichotomy video viewing experience. YouTube is one for the mot popular destination for people wanting to view videos on various categories from news to entertainment. YouTube is also a great place to publish homemade videos and photos. 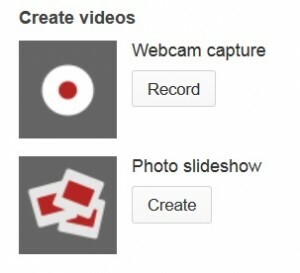 YouTube allows users to create YouTube photo slideshow to share slideshows with their friends and family. YouTube users have a Google account and if the user account is linked to Picasa, Google’s photo sharing product. When you upload photos to YouTube through Picasa, the process allows user to create YouTube hoot slideshows more conveniently, although you cans till upload photos directly from your computer.